[Purex Industrial] A registered trademark for a series of cleaning pad products. The original Billo [[steel|steel wool] cleaning pad was developed in 1913 by the Brillo Manufacturing Company. Brillo steel wood pads are composed of a fine grade steel wool pad embedded with a pinkish soap and baking powder. They were originally used to clean and polish [[aluminum]] cookware and utensils. 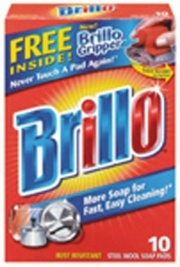 Other Brillo products included All-Purpose cleaning pads made from [[polyurethane]] foam and Scrub n Toss pads composed of a dual layers of white([[rayon fiber|rayon]]/[[polypropylene]]) and blue ([[polyester fiber|polyester]]).